Hydrox™ cookies, those Oreo-like chocolate sandwich cookies, could reappear on store shelves as early as September, says Ellia Kassoff, CEO of Leaf Brands, which recently acquired the rights to the unused Hydrox™ trademark. “The cosmic difference between Hydrox™ and Oreo is that Hydrox™ is a little more crispy; a little less sugary and stands up better in milk,” says Kassoff, who will make the official announcement later this month at the Sweets & Snacks Expo in Chicago on May 20. Even in a new world of nutritional consciousness, there is little evidence that America’s sweet tooth is fading. Sales of packaged cookies and baked goods are expected to top $17 billion by 2017 — up from $13 billion in 2012, reports Packaged Facts. internet use statistics . While the return of Hydrox™ is expected to be a hit with Baby Boomers who may fondly remember the brand — formerly owned by Kellogg’s, Keebler and Sunshine — it may be a tougher sell with Millennials who are not very familiar with the cookie brand, which hasn’t been regularly sold on store shelves in almost a decade. But the Hydrox™ brand has special meaning to him. As a young kid raised by parents who were Orthodox Jews, he was only permitted to eat Hydrox™ — not Oreos — because, he says, at the time, Oreos were not kosher but Hydrox™ were. Today, both are kosher. The move by Leaf Brands — which also owns trademarks to Astro Pops, Wacky Wafers and Farts Candy — comes just two years after giant Oreo celebrated its 100th birthday. Little-known, however, is that Hydrox™ was the original creme-filled chocolate sandwich cookie when it debuted in 1908 — followed four years later by Oreo. But executives at Mondelez, which owns the Oreo brand, are hardly showing any signs of concern. “Oreo is America’s favorite cookie,” says Laurie Guzzinati, a company spokeswoman. She declined to comment specifically on the return of Hydrox™. Oreo sales, which exceed $2 billion globally and $1 billion in North America, have grown double-digits in the U.S. for the past two years. Its been years since Oreo had a genuine rival on the shelf. Kellogg stopped making Hydrox™ in 2002. Then, in 2008, when Hydrox™ turned 100, Kellogg briefly resumed distribution, but only for a limited time. But unlike the cookies giants, which typically must sell at least $100 million worth of a brand for it to be an even modest success, Burnett says he can sell a fraction of that and do just fine. 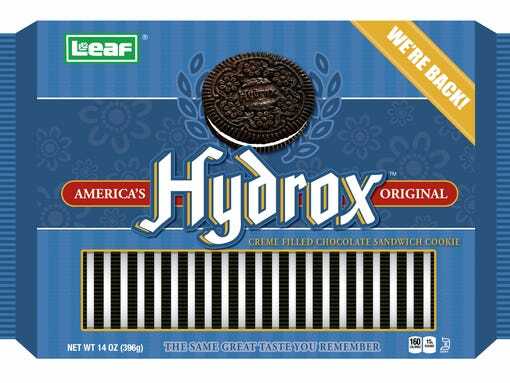 The pricing will be roughly where Hydrox™ was for years: less expensive than Oreos but more expensive than store brands. If a 14-ounce package of Oreos retails for about $4; Hydrox™ will be $3 and store brand sandwich cremes often cost about $2, he says. The cookies will be made at a factory in Southern California, but Kassoff won’t say where. Maybe he doesn’t want the fans lining up outside the gates just yet. But later this summer, when the first pack rolls of the line, Kassoff has big plans for that one.